Our mission is to create an environment that is a work of art, leaving a legacy of quality and individuality while successfully embodying the personal statement of our client. Our goal at Shauna Decker, BFA is to provide outstanding workmanship on time while meeting your exacting standards for professionalism. 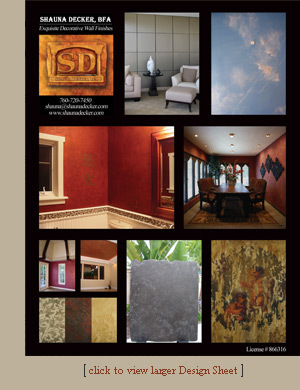 Shauna Decker, BFA is a Fine Artist who specializes in designer hand made decorative wall finishes. Shauna Decker, Principal of Exquisite Decorative Finishes, received her Bachelors Degree of Fine Art (BFA 1993) in Painting. Skills and workmanship have been enhanced with specialized training and certification in several areas of Faux, Decorative and Architectural Finishing from the finest schools in the Country – taught by internationally known Masters of the Trade. Shauna Decker, BFA is a Licensed Contractor in the State of California. Shauna Decker’s highest appreciation for the environment demands that we use environmentally safe products specifically fashioned for decorative finishing which produce an extremely durable finish. The techniques and styles used are cutting edge, unique and considerably more sophisticated when compared to the common “sponging” or “ragging” methods. We offer a Digital Service that positions whatever finish and color you would like to see directly onto your own walls if you cannot decide or need help to visualize a finish or color. You will receive a written proposal detailing your project and payment schedule. All working areas are protected with plastic, tape, paper, tarps, etc. before we begin. Your space will be left spotless and treated with the utmost respect. We provide unique solutions for Home Owners, Business Owners, Designers, Architects, General Contractors, and Builders. © 2008 ShaunaDecker.com, All rights reserved.